In between dispensing advice on breast-feeding and immunizations, doctors will tell parents to read aloud to their infants from birth, under a new policy that the American Academy of Pediatrics will announce on Tuesday. 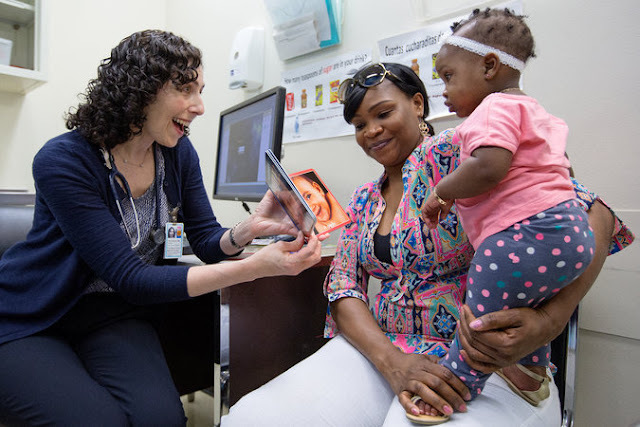 With the increased recognition that an important part of brain development occurs within the first three years of a child’s life, and that reading to children enhances vocabulary and other important communication skills, the group, which represents 62,000 pediatricians across the country, is asking its members to become powerful advocates for reading aloud, every time a baby visits the doctor. “It should be there each time we touch bases with children,” said Dr. Pamela High, who wrote the new policy. It recommends that doctors tell parents they should be “reading together as a daily fun family activity” from infancy. This is the first time the academy — which has issued recommendations on how long mothers should nurse their babies and advises parents to keep children away from screens until they are at least 2 — has officially weighed in on early literacy education. While highly educated, ambitious parents who are already reading poetry and playing Mozart to their children in utero may not need this advice, research shows that many parents do not read to their children as often as researchers and educators think is crucial to the development of pre-literacy skills that help children succeed once they get to school. Reading, as well as talking and singing, is viewed as important in increasing the number of words that children hear in the earliest years of their lives. Nearly two decades ago, an oft-cited study found that by age 3, the children of wealthier professionals have heard words millions more times than have those of less educated, low-income parents, giving the children who have heard more words a distinct advantage in school. New research shows that these gaps emerge as early as 18 months. According to a federal government survey of children’s health, 60 percent of American children from families with incomes at least 400 percent of the federal poverty threshold — $95,400 for a family of four — are read to daily from birth to 5 years of age, compared with around a third of children from families living below the poverty line, $23,850 for a family of four. Reading aloud is also a way to pass the time for parents who find endless baby talk tiresome. “It’s an easy way of talking that doesn’t involve talking about the plants outside,” said Erin Autry Montgomery, a mother of a 6-month-old boy in Austin, Tex. Low-income children are often exposed little to reading before entering formal child care settings. “We have had families who do not read to their children and where there are no books in the home,” said Elisabeth Bruzon, coordinator for the Fairfax, Va., chapter of Home Instruction for Parents of Preschool Youngsters, a nonprofit program that sends visitors to the homes of low- to moderate-income families with children ages 3 to 5. Dr. Navsaria is the medical director of the Wisconsin chapter of Reach Out and Read, a nonprofit literacy group that enlists about 20,000 pediatricians nationwide to give out books to low-income families. The group is working with Too Small to Fail, a joint effort between the nonprofit Next Generation and the Bill, Hillary and Chelsea Clinton Foundation that is aimed at closing the word gap. At the annual Clinton Global Initiative America meeting in Denver on Tuesday, Hillary Rodham Clinton will announce that Scholastic, the children’s book publisher, will donate 500,000 books to Reach Out and Read. Too Small to Fail is also developing materials to distribute to members of the American Academy of Pediatrics to help them emphasize the read-aloud message to parents.